As unlike most countries, New Zealand has no hunting seasons for Big Game Hunting. Our big game hunting starts in February and finishes in August. The only species there is a hunting season is birds. As you’re probably aware, New Zealand’s seasons are opposite to those in the Northern Hemisphere. When it’s winter there, it’s summer here. There are daily direct flights that leave Los Angeles and San Francisco for Auckland, which is your point of entry to New Zealand. Auckland is also the port where you will clear customs. From Auckland you will fly to Christchurch where we will either meet you at the airport or we do suggest you have a night in Christchurch to catch up after your long flight and then we will collect you from your accommodation the following morning. Click to download our recommended gear list. 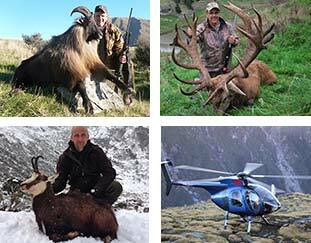 New Zealand is a “hunter friendly” destination. It is very easy to bring a conventional sporting firearm into the country. For import application form apply online at: https://forms.police.govt.nz/firearms/visitors-application You can have this paperwork filled out and sent to the Auckland Airport Police prior to your arrival and then upon arrival it should take no longer than 5-10 minutes to clear your guns at Auckland International Airport. We also have firearms available for your use, we do have a small charge to cover ammunition costs.